French boats confronted a handful of British rivals in the waters late last month to keep them from the area. FRENCH FISHERMEN HAVE said they had reached an agreement with their British counterparts today over access to scallop-rich waters in the English Channel, after the long-simmering “Scallop Wars” flared into a high-seas confrontation last month. “We managed to get an agreement. Tonight at midnight, they (the British fishermen) will leave the area in the Channel’s east and will only return on 1 November,” French industry representative Pascal Coquet told AFP. 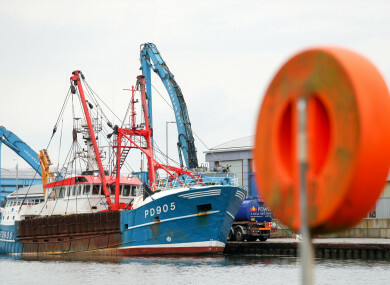 French fishermen have been incensed that British scallop boats are accessing the fertile waters off the Baie de Seine area of Normandy in northwest France, while French boats are only allowed to fish there between October to May in order to protect stocks. The French side had hoped to end a loophole that exempts British boats less than 15 metres, giving them first dibs at one of the main scallop sources off the French coast before the official season. However the French fishermen failed to get the smaller British boats banned. “We were forced to drop the 15-metres” requirement,” Coquet said. The French side agreed to give the British fishermen an additional fishing quota, he added. Jim Portus, the chief executive of Britain’s South Western Fish Producers Organisation, said it was “a compromise”. “It’s not the best deal… but it’s better than no deal,” Portus said. Email “French and UK fishermen agree to English Channel 'Scallop Wars' truce”. Feedback on “French and UK fishermen agree to English Channel 'Scallop Wars' truce”.